Funny tee. Pirates like rum. This Cthulhu pirate puts the Arrrrr in Arkham, with this new, 666 proof brand of rum, which has been slow aged in Arkham, Massachusetts, by Cthulhu Distillery. Guaranteed to keep any Deep One in his slumber. 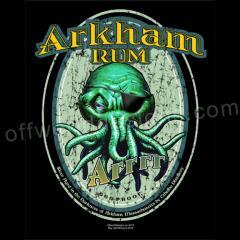 Any fan of HP Lovecraft and his mythos will appreciate this shirt.